Cone Screw Mixer Manufacturer In Pune, India. Cone screw mixer consists of a conical container which houses a continuous flight screw.The screw rotates about it's own axis and revolves along the walls of the cone. The material of widely differing densities and particle shapes and sizes are mixed homogenously without any degradation. Fragile filaments and flakes are safe from degradation and mixing is accomplished with minimal heat build-up and aeration in the product. The floor space required for this type of mixer is very less. The mixer can be started on full load. Due to the conical shape the unloading of the material is helped by gravity and is complete without any hold-up. Addition of liquids is easily possible by providing atomizing nozzles at the top of the mixer. There are no bearings or seals in direct contact with the product. a) Capacities from 20 to 25000 liters. b) Supported mixing screw at vessel bottom. d) Sanitary designs for pharma applications. f) Jacket/ Limpet for heating or cooling. Typical applications include dyes, herbal, pharmaceutical, plastic, food, ceramic, agricultural products, shampoos, tooth paste, chocolates, gelatins etc. Materials are mixed successfully to an accuracy of 1 part in 1,00,000(0.001 %) or better. With no degradation or separation, it thoroughly blends materials of widely differing densities and particle shapes and sizes. It achieves a thoroughly homogeneous mix in 30 to 40 % the time of most conventional mixers in the same category such depending on mixing element speeds. 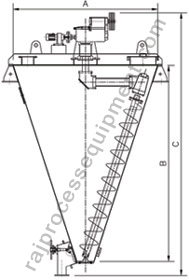 Cone screw mixer (Nauta Mixer) require approximately 50% power over conventional blender. Fragile filaments and flakes are safe from degradation and mixing is accomplished with minimal heat built-up and aeration in the product. Since mixer occupies less floor space, user can free up space for other plant operations. Its screw agitator begins axially rotating and loosens batch material before its orbiting motion starts. This design feature prevents stalling and permits starting under full load in the event of a power failure. 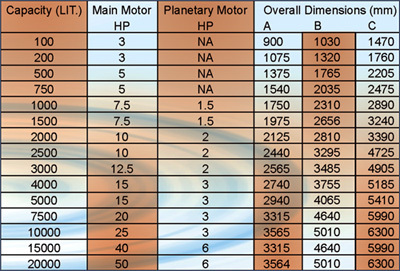 Soft starters are available to reduce excessive torque at start-up. Its unique cone design provides for gravity unloading, gives cleaner and faster batch discharge. Liquids are injected and atomized into the top of the mixer through the hollow shaft of the drive system. Partial or full load batches are mixing equally well with no reduction in mixing efficiency. The top entering drive system provides full product protection with no bearing nor seals in direct contact with the product. Its unique obstruction free cone shaped design allows for quick and easy cleaning.